I spend one in three nights on the road -- in hotels, on friends' couches, even in RVs -- and figuring out luggage is my obsession, which is why I gave Valet Luggage Compression Shelves a try. When I'm on the road, I rarely spend more than two nights in one place, which means I optimize for unpacking and repacking -- I want to stagger into a hotel at 10PM after a gig, get my toiletries out and be in bed in 15 minutes, then get a change of clothes and repack the next morning in 10 minutes before I head to the airport. I long ago switched to compression sacks for my dirty laundry -- if you don't care how wrinkled something gets, you can squeeze it down really small with a good compression sack. I use a Grid-It with a carabiner for my toiletries, clipping it onto the hand-towel rail when I check in, unclipping it and laying it flat in my suitcase when I'm ready to go. I didn't have a great way to pack/unpack shirts, smart jackets and trousers, though. My wife spotted these compression shelves in a Skymall and I ordered a set. Unlike virtually every other Skymall gadget, these didn't disappoint. 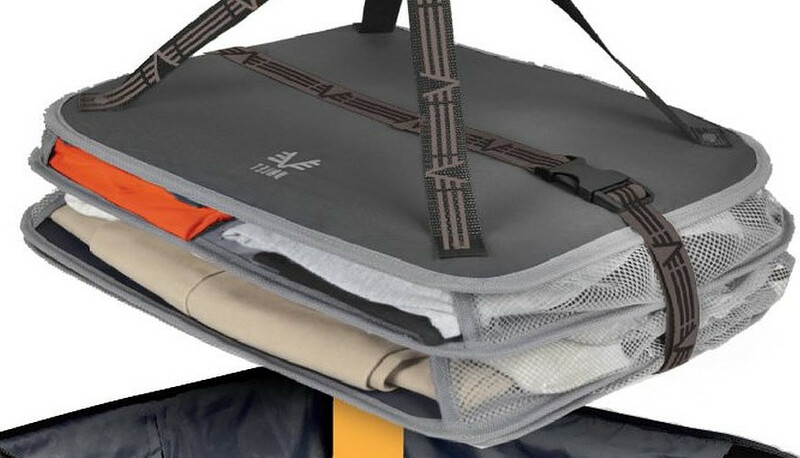 Assuming you have the patience to fold your stuff, compression shelves to an amazing job of keeping them relatively wrinkle-free (better than the folding board/portfolio things from Eagle Creek), and they make it very easy to access all your clothes, not just the stuff on the top of your suitcase. I found the hook at the top to be a little small for over-door hanging (it took a lot of grunting to get it into place), but there were plenty of other places it hung well, such as the clothing bar in the room's closet. I've used my compression shelves while staying on a pull-out couch in my parents' basement in Toronto, in hotels in Phoenix, Denver and Memphis, in an RV while driving with my family all over the Grand Canyon area, and at a friend's small apartment in San Francisco. I found it consistently easy to pack and unpack and fantastically convenient (for example, in the RV I opened it every morning to get my clothes for the day, then compressed it and strapped it shut and slid it sideways into a high shelf). Compression shelves are now a permanent addition to my travel kit.